An ancient Greek text that’s been covered by more recent religious writing. If you’re a history buff, you might not know much particle physics. But the two fields share more in common than you’d think. 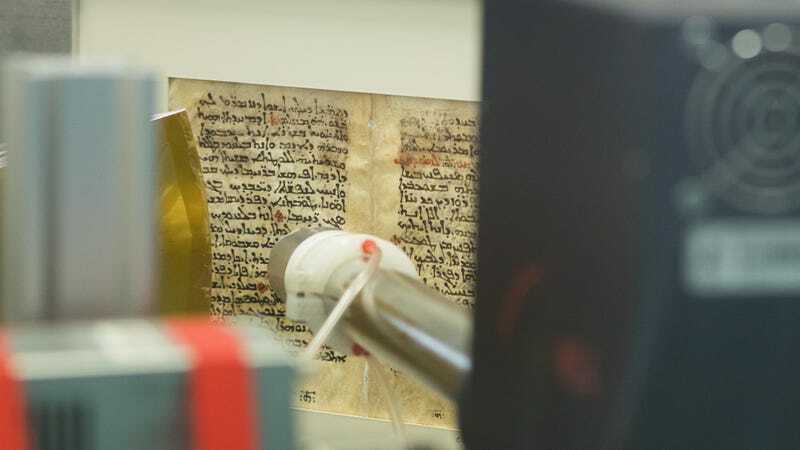 X-rays from a high-energy lab have revealed ancient Greek medical texts that had been stripped and covered with religious writing. Scientists at the Department of Energy’s SLAC National Accelerator Laboratory have long been using high-powered x-rays at their Stanford Synchrotron Radiation Lightsource (SSRL) to analyze ancient texts. This week, they’ll be revealing the text beneath 10th-century psalms from the St. Catherine’s Monastery on the Sinai Peninsula. The hidden words were a translation of writings by the ancient Greek doctor Galen. Synchrotrons might sound complex, but they’re a relatively common kind of particle accelerator. Rather than crash particles together like researchers do at the Large Hadron Collider, the SSRL just accelerates electrons to nearly the speed of light and keeps them traveling around a many-sided polygon. Magnets on the straightaways and bends change the electrons’ directions, which produces a beam of high-energy x-rays. There’s all sorts of stuff scientists can do with these x-rays, like imaging, characterizing what something is, or revealing mysteries between objects’ surfaces. Here, the researchers reveal the ink that had been scraped off, which they can detect based on the way the x-rays react upon hitting the surface. The text contains Galen’s words translated into the ancient Syriac language a few hundred years after his death, reports LiveScience. Galen himself was a Greek doctor in the Roman empire who lived from 129 to around 216 C.E. He studied all sorts of medicine through dissecting apes (he could not dissect humans, according to Britannica) and his works remained influential into the Middle Ages. He still believed the outdated study of the four humors, but he made some important discoveries, including that arteries carried blood, not air, as had been previously believed. Researchers will scan each of the religious texts’ 26 pages to produce high-resolution files that they’ll post online. Each page will take about 10 hours to scan. It’s not the first time science has used high-powered x-rays to understand history and art—others have looked at Picasso’s paintings and even ancient poop. But it does go to show just how science has transformed the study of the ancient.